What has one got to do with the other? Violent racial incidents are on the rise locally and globally. When these are played out in the full glare of publicity in the media, our reaction as South Africans is one of shock and disbelief. That twenty four years after witnessing the glorious liberation from the inhuman, torturous and cruel apartheid system of institutionalized racism on a grand scale with thousands fallen in the struggle, that it still exists. Racism didn’t begin or end with apartheid. It existed before time began when according to Islamic teachings, Satan refused to prostate before the father of mankind, Prophet Adam (peace be upon him) as commanded by Almighty Allah. “What made you disobey Me?” Satan replied, “I am better than Adam, for You have created me out of fire and Adam out of clay.” Surah 7: Verse 12. This belief is an apt definition of racism. A belief that race is an inherent and determining factor in a person's or a people's character and capabilities, rendering some inferior and others superior to be discriminated against. Satan’s refusal was driven by his racist feeling of superiority. Ethnicity, tribalism, nationalism and religion are all rooted in racism and has been the cause of conflicts over the centuries with catastrophic results. The world recognizes this and scholars and statesmen have drawn up constitutions and charters such as the Universal Charter of Human Rights. Whilst racism can be removed from the statutes by the stroke of a pen, it cannot be exorcised or wished away from the hearts and minds of people. These ideals were taught and exemplified by the Messenger (peace be upon him) during his ministry on earth. He drove out the scourge of racism in society to the extent that the haughty “blue blooded” Arab nobility accepted the call to prayer by a freed Abyssinian slave. Everyone was equal in the eyes of the law. Unlike other systems this was a proven historic demonstration of the Divine system of Islamic law in action. During Ramadaan, Muslims fast to wage an internal struggle to burn away the impurities that afflict their bodies, minds and souls. It is a month of mending hearts, souls and relationships both with God and with fellow human beings for rejuvenation in the year ahead. The institution of Fasting allows us to have empathy with the pangs of hunger experienced by fellow human beings irrespective of colour and creed. We seek the blessing of feeding the poor. We stand nightly in congregational prayers shoulder to shoulder with fellow Believers without allowing the devil of racism to stand between us. Ramadaan is indeed connected to racism in that it is an annual antidote to cleanse ourselves from the spectre of racism and give effect to the principle espoused by the Prophet (peace be upon him) that give effect to the values that all Muslims are brothers and a brotherhood. All are equal with no one superior than the other except in piety. In keeping with the spirit of Ramadaan, our prayers are for all our certified plants, member organisations, associates, well-wishers, staff, families and friends, Muslim brothers and sisters, fellow certifiers and our critics to emerge from the fast stronger to build a non-racial society based on peace and justice for all. Aameen. Life didn’t begin at forty for Fourchem. It began forty years ago when the owners set out to establish themselves as a national ingredient supplier of exceptional service and unquestionable quality. Globally approved, top quality ingredients suppliers. A wide range of speciality chemical ingredients. Local stock holding in secure, clean warehousing. 3 months buffer stockholding based on client forecasts. Delivery within 24 – 48 hours on stock items. Full technical back up and support from our global partners laboratories. Regular new product innovation/global trend analysis presentations. Regular account management & sales support from our friendly, professional staff. They are proud members of SAAFFI and are certified Halaal by SANHA. Click here to view more details and contact numbers. Whilst the Hadith is general, one may procure or bake whole-wheat pita bread, if out of love for Allah’s Messenger (sallallahu alayhi wa sallam) one wishes to consume bread resembling his bread as close as is possible in our era and circumstances. 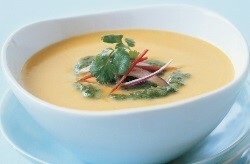 Soup is a traditional starter dish at the Ramadaan iftaar table in most parts of the world. It is the original “feel good” concoction that our mothers gave us when we were sick. Soup warms our body and is easily digested. It is fibre rich, nutritious and hydrating. Supplement the traditional Haleem with a healthy variety of soups each and every day. Here is one to get you started from the Radio Islam collection of recipes. Just before serving add the following & bring to a boil once more. During a visit to the famous Al Falaah Institution of learning in the coastal city of Durban, Halaluddin addressed the little learners. "If I sold my house, all the household goods and my car and gave all the money to Al Falaah College would that get me into heaven"? Halaluddin asked the children. “NO"! the children all answered. “If I cleaned the Musallah every day, swept this classroom and kept everything neat and tidy, would that get me into heaven"? Once more they all answered, “NO"!! “Well, then, if I was kind to animals and gave candy to all the children and was very kind to my wife and family, that should get me into heaven"? Halaluddin asked them again. Once more they all answered, “NO way"!!! *"YOU HAVE TO DIE FIRST..."!!! Africa's premier international food and drink show puts your company in front of F&B leaders and professionals across the continent. Ten SANHA certified establishments were present with assistance from the Department of Trade and Industry (DTI). Being overweight is known to increase your chance of developing major issues such as strokes, heart disease, high cholesterol and diabetes. Low-GI breads also contains fibre, which is essential to maintain bowel health, aids in achieving a healthy weight, and increases the feeling of fullness. Feeling full not only stops you from eating very frequently to satiate your hunger, but it also curbs you from having to reach for foods that might not be low GI, and which could give you quick energy spikes, followed by a low. 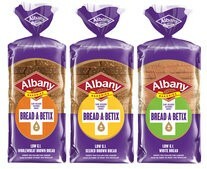 Albany’s new low GI bread-a-Betix range launched in time for Ramadaan and beyond. For more information see our column Tell Us and We’ll Tell The World. Albany bread and rolls are SANHA certified. 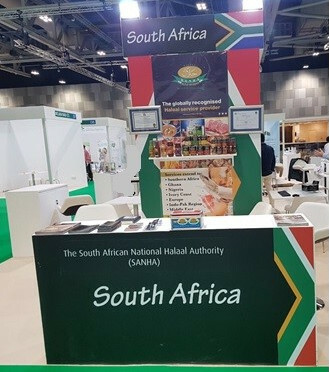 Thousands of food professionals have already registered for Africa’s largest international premier food and drink trade show. Why? Because it's so much more than just an exhibition, it is the continent’s most important annual meeting place for the food and drink industry. In addition to accessing leading suppliers and products, this is your opportunity to gain insight into the very latest developments affecting the industry. Take part in FREE workshops and training, watch aspiring pizza makers at the Global Pizza Challenge, and see leading chefs compete for the Inter Hotel Culinary Cup and meet and share experiences with your peers. A new look conference attracting senior F&B experts - The Food Leaders Forum - has been created to help you tackle key challenges, issues, understand latest regulations and keep abreast of opportunities within the industry. If you want to remain successful this event is perfect for you. Certification terminated by mutual agreement. Delivery Xtreme has erroneously used the SANHA logo on the above store advert. The said store is NOT certified by SANHA. Q. Please advise if duck meat is Halaal as it has webbed feet? A. Duck is a Halaal species. Regrettably, it is an oft-repeated misconception that birds with webbed feet may not be eaten. Furthermore, the act of certain people of first slitting the webbing before slaughter is an act of gross cruelty not allowed in Islam. Q. I would like to know if I can use Maya nail polish that they advertise as Halaal, wudhu- friendly. A. Notwithstanding the permissibility / impermissibility of wearing nail polish, our response deals with its suitability for Wudhu/Ghusl purposes only. It should be noted that it is a requirement for the validity of Wudhu/Ghusl that water reaches the necessary parts to be washed. Nail polish generally forms a coating over the nails that prevents water from reaching the nails and the surrounding skin, thereby affecting the validity of the Wudhu/Ghusl. Yes, if the nail polish is completely permeable and water can pass through it with ease and quickness then there would be leeway for its usage. Water does not seep through on its own. The surface has to be rubbed for at least 10 seconds to facilitate the water to pass through. Despite rubbing it for a while, only some areas beneath the nail polish became moistened. There is no guarantee that the surface beneath the crusty areas of the nail polish, around the cuticle (eponychium), is moistened – even with rubbing. For the completion of wudhu, it is compulsory that the nails are washed. ‘Washing’ is only complete when enough water is used that some of it drips off the washed part. As can be seen from the above, at most the area will be moistened (masah) and not washed (ghusl) which is a necessity in Wudhu. In conclusion, since water does not seep through easily as per Shari’ requirements, the MAYA nail polish will constitute an impediment for a valid Wudhu/Ghusl. By far one of our very popular giveaways but do not delay. After 47 years of baking using leading technology Albany offers the most comprehensive range of freshly baked bread that is long lasting in freshness and superior quality. With ten bakeries countrywide they offer a range of breads, buns and rolls. All products have met the highest standards of Halaal and is certified by SANHA. Click here for further information. See the I Didn’t Know That column for information regarding a healthy diet. The sheer joy of participating in the blessed activities of Ramadaan of the daily fast, the increased acts of prayer, charity and good deeds, the tolerance, patience and camaraderie, will spiritually beautify your inner being. Why not supplement this inner spiritual beauty with these few complementary beauty tips for the outside. You can do it without makeup. Mix ingredients and apply to your skin, gently massaging it with the balls of your fingers in light circular movements, then rinse off with water. For a deep cleansing and radiance boost, fill a bowl with boiling water and add the juice of half a lemon and a dash of rosewater – and for a lovely treat add rose petals. Hold your face about 20 to 30 cm above the bowl and place a towel over your head to trap the steam. Steam your face for three minutes. This technique will help open pores and is a great cleanser for your skin, leaving it radiant and soft. Treat your eyes by soaking two cotton wool pads in cold chamomile tea. Leave on for 10 minutes; it has a cooling and soothing effect. Make your own body scrub by mixing a handful of oatmeal and bran with rose water. Use a loofah and massage into damp skin, moving in small circular motions. This improves circulation for a healthier body. By exfoliating at least twice a week, your skin will be smoother with a healthier glow. For a special foot treat, soak your feet in a bowl of lukewarm water; add a few drops of peppermint, chamomile and lavender essential oils. A foot pamper helps relax your mind; it’s one of the most popular beauty indulgences. By not wearing lipstick, lip-gloss or lip balm during Ramadan, your lips might feel dry and chapped. At night, put on a layer of Vaseline or lip balm to keep your lips hydrated. To maintain a healthy skin, drink at least two litres of water each day. I know this can be difficult during Ramadaan, but try to drink at least two glasses in the morning and two glasses at night. A cup of boiling water and a few drops of lemon juice can flush out any impurities that may have built up in your system overnight. Indeed it is a great blessing that 2 million people of the Ummah will get the opportunity of performing Umrah this Ramadaan. We thank Allah Almighty for allowing them this opportunity and may He reward all those who assist in the preparation in facilitating this duty. 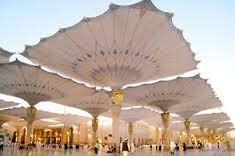 This year to minimize the effects of the northern hemisphere high summer temperature the world’s largest folding umbrella will be installed in the most Sacred Mosque measuring 53 x 53 metres.